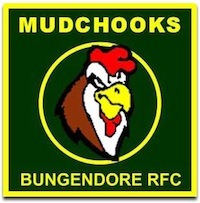 The Bungendore Mudchooks Rugby Union Football team is Bungendore and District's own bush rugby team, established in 2003. The Mighty Bungendore Mudchooks compete in the Monaro Division 2 Rugby Union competition run by the ACT Rugby Union. The competition draws teams from the surrounding regions and includes 6 teams, spread from Taralga and Crookwell in the north, Boorowa to the West, Braidwood in the east, Jindabyne in the south, and of course Bungendore. To undertake this task the “Muddies” are seeking players, volunteers, supporters and sponsors for the upcoming season. Training has started at the Bungendore (Mick Sherd) Oval, Gibraltar St, Bungendore on Tuesday and Thursday nights from 6.30pm. Anyone interested in playing some great social country rugby is welcome to come and sign up. The club always welcomes volunteers and supporters to come along and help out on game days and cheer on the boys. It is said that the Muddies are 10 points better at home at the “Coop of Pain”. Training is every Tuesday and Thursday night at 6.15 pm at the Mick Sherd Oval Bungendore. All new players welcome. The Muddies also require sponsorship dollars to achieve on and off field success. If there are any businesses out there looking for an opportunity to help a local sporting team that is part of your community then don’t be shy to give us a call. For details of the seanson's draw, visit the Mudchooks website.